Every Night is Game Night - Designer Round Table on Games with Non-traditional Themes... Two Parter, Episodes 120-121. Thought might be of interest to some, especially those keen for Wingspan. 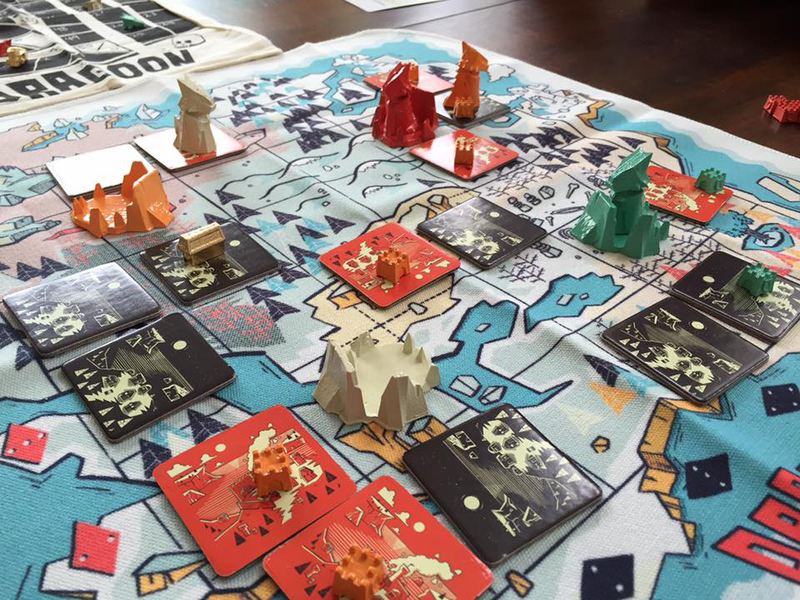 "Three designers of excellent games with non-traditional themes - Elizabeth Hargrave, designer of Wingspan; Sarah Reed, designer of Oaxaca: Crafts of a Culture; and R. Eric Reuss, designer of Spirit Island." Part 2 is more about games research, world cultures in games and representation in design, publishing. Regarding Gloomhaven on TableTop Simulator - does it save state between sessions? By state I mean the upgrades, coin, Exp, etc. on the characters? Also stuff like Road and City event card order and which ones are removed from the game? Places you've visited? Achievements? I'm not even sure how TTS works. I bought it but haven't used it. I think it's all manual - ie. it doesn't know the rules and doesn't have AI, which is how I'd want it. I own GH but have 2 remote people that may be interested in playing so I though this may be a good way for them to try it out. In Tabletop Simulator, in any game, you can save the exact state of the table, everything about it saves. 1. right click on the map tiles after they are placed and Fix/lock them so they don't get accidentally picked up and moved (Erik and I had some sad, Spirit Island experiences learning this lesson). 2. Switching to top down view from 3rd person makes placing tile pieces MUCH easier. 3. Shortcut keys to shuffling decks, holding right mouse over a deck of cards to move the whole deck rather than one card, and a host of other. I have used it weekly for running a D&D campaign. I am far from an expert, but I have learned enough to wing a couple of things. Haven't played GH on it yet, but a number of boardgames along with D&D. Thanks, folks. Great to hear. How do you use it with D&D? Do you load your maps into it and use virtual minis like people do on Roll20 and the other online collab sites for PnP gaming? What else does VTT provide for remote D&D? If there's a good video or link that explains everything, feel free to just send me there instead of typing a big reply. My son uses TTS for GH to play online with friends around the country. The setup and such is all automated (deck setups, e.g.) but no rules implementation. I think that is the basic idea all around for TTS. However, it has been announced that an actual GH video game is being developed; obviously that would have rules implementation built-in. TTS has some handy keyboard shortcuts. Me pass on a chance to type a big reply? Unpossible! So, Minotaar and I considered multiple options (we each started games that the other plays in) for VTT. I have a full boat subscription to D&D Beyond that I could share with everyone in both campaigns, meaning that everyone has access to the wonderful character creation tools as well as access to all the reference books. Given the Beyond tool, we really didn't want or need the player tools of Roll20 or Fantasy Grounds. 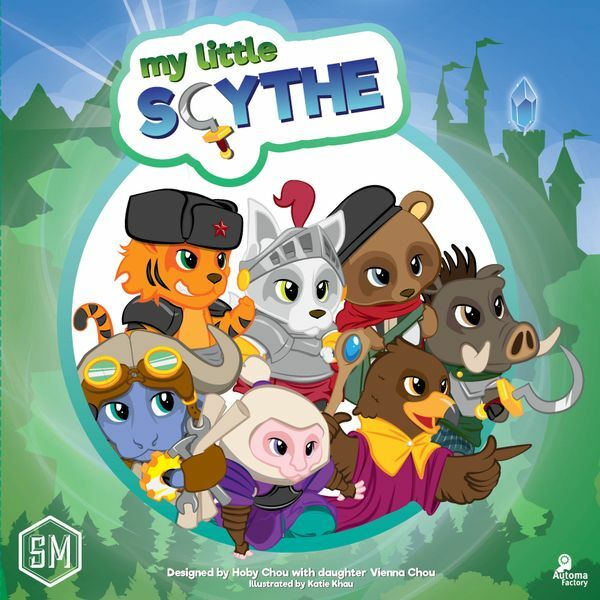 We voice and video chat on Discord on the GWJ server, use Beyond for our characters, and use TTS as if we are sitting around a table for any minis or maps. We both ran the updated Sunless Citadel from Tales from the Yawning Portal so we could share created assets (maps, etc.) as we had a lot of first time and long-lapsed D&D players. We have each cateloged our respective campaigns HERE (mine) and HERE (Minotaar's) and Mino's has some screen caps that EriktheRed took to give you an idea. If you decide to go that route, hit one of us up. We used some pre-build stuff and assets, but have learned how to import and size maps to a reasonable extent. We each have really leaned into more of the 2D maps. While the 3D assets look cool, they tend to impede actual gameplay. BHChrist - Thanks. I’ll do a better reply when I’m not on the phone. ALERT: Gloomhaven is on sale on Amazon. . I think the removable stickers are, too. $115 shipped with Prime for the game. The sale probably won’t last long. FYI class spoilers in the images that amazon is hosting. I looked in the Workshop and found multiple GH games. I imported "Gloomhaven - Fantasy Setup (ScriptedUI)" so I had something to mess with. is this the one you guys recommend? Pretty cool! I haven't looked into the shortcut keys or anything, but it was fairly intuitive. I liked that it would set up the encounters for you and keep the maps you should see hidden. In our cardboard version campaign, we normally play with 3 but sometimes only 2 and rarely a 4th will join. Does TTS easily support changing the number of players on the fly ( setting up the bad guys, etc. ) or would we have to play the 3rd guy if they weren't able to make it that session? I wouldn't want to delete a player's saved info if they miss a session and have to rebuild it next game. And lastly, would anyone want to play just the first scenario on TTS sometime with me so I could get comfortable with it? BHChrist - I looked at your guys' campaign threads - great stuff and thank for the information. Are you guys doing anything for Fog of War on the maps? Which workshop mod are you using for your D&D games? I just use the tool that is third down on the left at the GM (dark gray) and hide segments of areas. It is a bit of a pain, and you then have to right click on the box and change the setting so others can't see through it. I tried the built in fog of war once and it may work ok. I was more comfortable with the other method and felt it was more reliable. I will have to revisit the FoW feature. Mod: Drewgo's DnD Complete Multiplayer Setup - This is a great starting point. We deleted the tablets because they were annoying. Also cleared out some other things then saved the set up how I liked it. I walked 3or4Monsters through it last night before my session (recap is up) so feel free to hit me up if you see me on sometime. We talked over Discord and it worked pretty well. "I DO NOT RECOMMEND LOADING THIS GAME ON LOW-END COMPUTERS. Instead, hit the Options button on the game's thumbnail and click 'Expand' to sort through the game's miniatures. mz4250 has designed and uploaded a 3D model for each creature in the Monster Manual, which he released for free for 3D printing on his Shapeways page. I've downloaded a large portion of these models and imported them into Tabletop Simulator. Steam user jehunter80 has begun creating textures for some of the models included in this collection. Though texturing is a time consuming process, you can already enjoy some of his work right now! Models with optional textures are marked with a [T] in the list. Don't forget to thank jehunter80 for his incredible work!" Recently back from a great time at PAX South in San Antonio. As in prior years they had a strong showing for indy board games, and a fantastic game library for use in the tabletop free-play area. It was challenging to stay focused and not have constant FOMO, but I took it easy-as-it-went this year and managed to play (or demo) four games new-to-me. I'd seen Dragoon in the library last year and checked it out this year entirely judging it by the graphic design on the cover. There were twenty other drop dead cool looking box covers to choose from, but this looked easy to sit down and play. And it was! 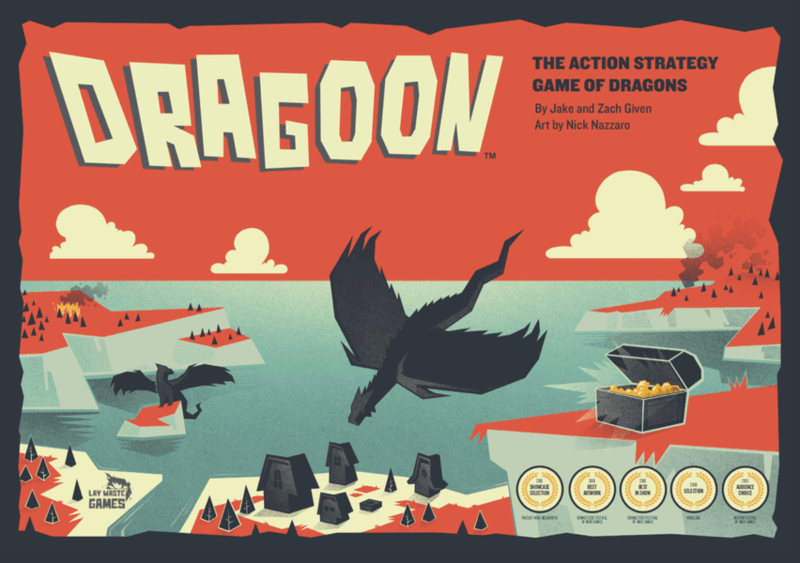 1-4 people play dragons rampaging around an island, stealing gold from towns and villages that spawn around the map. There is a lot of satisfying dice-chucking (to spawn villages and resolve dragon fights) but our tight score cluster at the end of the game points to some good game balancing. The board is a cloth map and the pieces are artfully sculpted in line with the box aesthetic. You know the games you played as a kid that were terrible but you had fun chucking lots of dice? This felt like a not-terrible version of that for the same kids-grown-up (though still kid-friendly). This is the best picture I could find on BGG...these look like 3d printed prototypes, ours were the same shape but smoothe, matte and much nicer looking. Having played Scythe several times this seemed like an easy one to pick up and play quickly. It's impressive how well the "kid" ruleset works, and the theme tweaks are pretty adorable: the popularity track becomes the friendship track and military engagements become pie-fights. The gem, apple and quest resources are appealing to run around collecting with the chunky minis; I'm less fond of the cartoon-y color palette for the game board. The same structure of first-to-X-achievements applies. It was fast, fun, and perfectly executes on providing a gentle on-ramp to big Scythe, if that's what somebody needs. 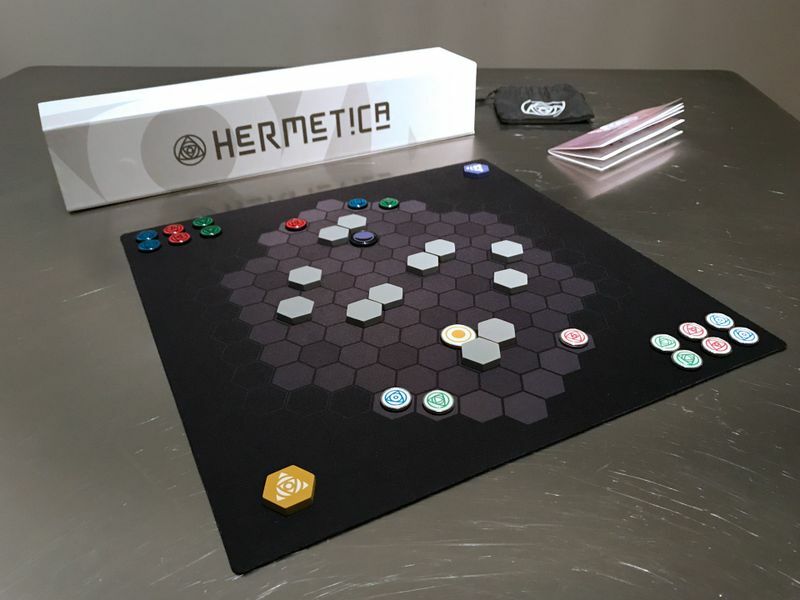 I like a lot of theme in my board games, but Hermetica caught my interest in the Indy Board Game Showcase area. I sat down for a demo and decided to snag a copy (online, since they'd run through their stock). The goal is simply to get your "king" piece to the opponents "end zone" (my terms), with the ability to spawn in a selection of pieces which have thier own movement and abilities. Individually they can't do too much, but with three activations per turn you can quickly use them together in interesting combos. The production quality is quite appealing and it felt like a nice souvenir for my PAX this year. You can play the game free online here. And--because I was hanging out with a huge Harry Potter fan--we ran through the intro scenario to Harry Potter: Hogwarts Battle. 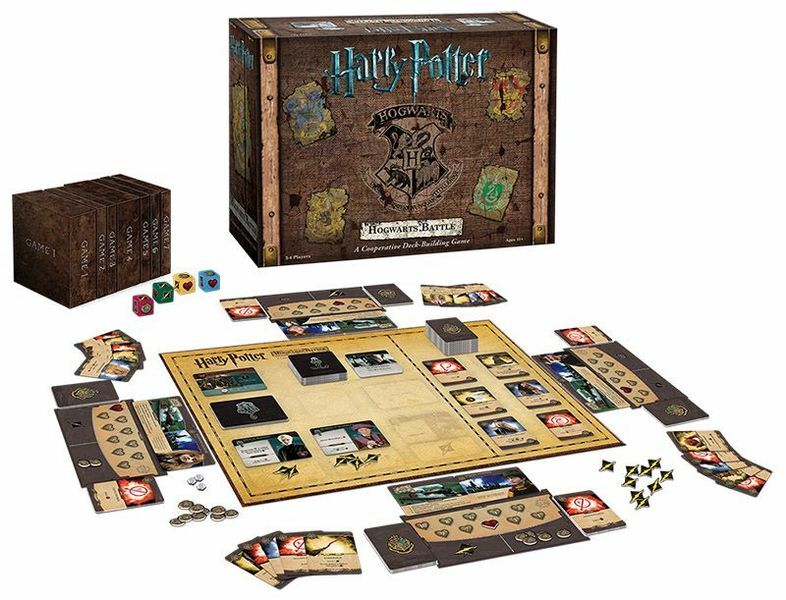 It's very much Thunderstone meets Potter, but it was hard to judge too much by the first scenario, a glorified tutorial for the rules. Original art would grab me more than stills from the film, but I could see how this could appeal to a wide swath of Potter fans. I'd be curious if anyone can speak to how the game progresses as new boxes get opened. Hey, if you're near Tennessee, or want to come visit, you need to check this out. It's easily the best value convention that I've ever enjoyed, and there's always a fair number of Goodjers to face across the cardboard battlefield. So, after spending Thursday thru Sunday with PewPewRobo and the rest of the GWJ contingent, I got shipped off to the bustling metropolis that is Jackson, MS. Not sure how many here are familiar with Certifiable Studios, but they've made several games that my group plays on a regular basis, and they happened to be based 2 miles from the hotel we stayed at. I flew from DFW into Jackson on Monday, and I several hours to kill before a business dinner, and since I knew I'd at least get to drop by, I brought a couple of items to get signed by their lead designer, Jesse Labbe'. Not only did Jesse graciously sign the two items I had, I got to meet the whole design crew of the studio, play the prototype of their most recent kickstarter (D6), as well as walk away with several prototype parts that they didn't need anymore, limited editions of Who Goes There and Stuffed, all of the expansions for Endangered Orphans of Condyle Cove, dice cups, custom dice, playmats, and two art books. Needless to say, this company has a fan for life now. Not only did Jesse graciously sign the two items I had, I got to meet the whole design crew of the studio, play the prototype of their most recent kickstarter (D6), as well as walk away with several prototype parts that they didn't need anymore, limited editions of Who Goes There and Stuffed, all of the expansions for Endangered Orphans of Condyle Cove, dice cups, custom dice, playmats, and two art books. Needless to say, this company has a fan for life now. That's amazingly generous of them. I love the art on their website and I am now curious to play some of their games. I'm honestly still sort of shocked about the experience. My group has played all of their games, and each has their "place" in our rotation. Endangered Orphans is our go-to filler game, since you can play it fairly quickly, and its a fun "screw your opponents" sort of game. My wife really enjoyed Stuffed, and at $23, its a great value. Who Goes There is, however, our favorite game, by far. It tends to run long (3.5-4 hrs for a 5 player game), but the experience is worth every moment. The first game we played, we spent almost 45 minutes arguing and debating who would get on the helicopter at the end, and the baggage from that actually played into the negotiations on our second play. If you buy Who Goes There (WGT), go ahead and splurge for the full box. For $120, you get everything, including probably one of the best box inserts on the planet. Though Pyxi was kind enough to split Lovecraft-games into their own thread, I thought people here might also be interested in My thoughts on Arkham Horror 3e. I finished my first homemade foam core insert. I got two inserts from Rob Searing, https://www.inserthere.me - Civ and Colonists. So I had great examples to get guidance from. I know they are not perfect, far from. But it survived the upside down shake test. Nicely done, Stingray! I'm not THAT skilled, so I'm probably going to plunk down the cash to get the insert for Near and Far, because...damn. That game NEEDS one. As new boxes are opened it was a delight for my family to see new items being added to the store, familiar characters, etc. The protagonists each get powers to help with the progressively more powerful villains. The game DOES get more complicated and this does add a much-needed bit of depth to it; but again I want to point out that it is still somehow fun at all stages. That "glorified tutorial for the rules" that you mention... that goes away at around Book 4... so if you didn't have any fun in Book 1, you might have to give the game multiple plays for that feeling to disappear. By Book 5 you will probably experience your first solid fail... by book 7 you'll feel like the odds are truly stacked against you. It still managed to bring us back to the table, and I have a feeling that I could drag everybody back to go through all 7 books again should I be feeling it - I can't say that about a lot of games, but also we are minor Potterheads. You asked specifically about progression: you get additional powers just by having the kids "age" through the books, which is nice. They eventually add your choice of an additional power. The villains get progressively harder and more numerous, you're facing more villains and more at a time. The dark arts cards more punishing; there are markers that go on the location cards that indicate complete failure and the villains and dark arts cards more directly relate to adding those markers to those cards, so risk is increased. To balance all this out, of course, there are improved cards in the "store." It's funny that (as with most video games) the difficulty spikes, while your powers spike right along with it... yet it really is the same game as what we started with... the difference is that there are far more "Oh we JUST survived that" moments. And I think it is that feeling that kept (and keeps) us playing it. I'd caution you AWAY from the expansion, to be honest. It adds almost too much complexity and it feels very much like the majority of it is AGAINST you. It's a bit like taking the game to a sort of hard mode that feels unnecessary and migraine-inducing. Awesome, Stingray! Aside from using the insert for a different game as an inspiration, did you work out the layout yourself? Impressive execution, either way. By Book 5 you will probably experience your first solid fail... by book 7 you'll feel like the odds are truly stacked against you. It still managed to bring us back to the table, and I have a feeling that I could drag everybody back to go through all 7 books again should I be feeling it - I can't say that about a lot of games, but also we are minor Potterheads. My son and I had the complete opposite experience. We were only pushed once, and that was maybe book 2 or 3, and even then were not in any real danger of losing. We cake-walked through 5-7. Granted, we enjoyed the game quite a bit, and got through all 7 books is a short time period because we enjoyed it, however, we have not touched it since the book 7 victory. We verified rules multiple times to make sure were not not misapplying rules or something, but I think we just both figured out out character decks and the shop cards. From talking with others, our experience seems to be more the exception rather than the rule. I like the game, and glad I played it. I believe it does a fantastic job at teaching deck building. I just don't think it will see the table again for us. Just picked up Gloomhaven. Is there a recommended set of storage containers for all the bits and pieces? Anyone using one of the commercial solutions? Is the Feldherr foam set any good? I believe the affordable answer can be found by Googling for Yet Another Storage Solution.